Mormon Mommy Writers and Friends: It's time for organizing! After moving out of state recently, organizing my life has been on my mind a lot lately. Moving seems to give me a sense of trying to frantically organize and streamline everything, and I often just want to keep purging and purging, trying to make things feel tidy. I love the feeling of opening a drawer, or cupboard, and seeing everything inside nicely arranged and usable. I also love the feeling of donating or selling things that we don't use anymore, and seeing the space and lightness it gives our house. I feel like I can breathe! Even though I have been trying to slowly tackle our home over the last couple of months, one area that hasn't been looking so great is my writing organization. I have so many different places to write, I feel a little like I have writing ADD. I had written some of my book on a desktop computer, then when my husband generously bought me a laptop to help with my writing dreams, I started writing there. I also have a notebook to jot down ideas for when I don't want to get the computers out, because sometimes a good old pen and paper is nice too. THEN, I also have ideas and notes typed onto my 'notes' app on my iPhone. And as if that weren't enough, I have a mini diary I keep in my diaper bag, for yet another place to jot down ideas and inspiration quickly. Although, I probably bought that more because I love little tiny notebooks and journals. They are so cute and full of so many possibilities! If I could I would have a whole organized drawer full of journals and mini-journals stashed away in my home somewhere. All these methods are effective and have helped on some occasions, but now, I feel a little scattered. I love having the option of writing down thoughts for when an idea strikes, because often we think we will remember an amazing idea, to only be mad at ourselves later when our Mommy brains won't function as well as we thought they would. My question is, how do you organize your writing life? What works for you? How do you keep your book ideas/ideas in general organized? I don't do organization, but I'm totally with you on loving the tiny notebooks and journals. One thing I've done with my WIP that's been helpful is keeping it all as ONE document. It's long, but it's all there. As I finished different sections each week, I would send the whole thing to my mom, and just highlight the new parts. That way, I know the newest (1 week or less) stuff is, if nothing else, in my e-mail account or hers. I have 2 other documents for that WIP- one with a scene outline & page numbers (so if I need to find a part quickly, I can) and various notes about scenes I want to add or other ideas I have. I try to periodically gather my random receipts, bill envelopes, and napkin scraps that I've jotted down ideas on (I love the little journals but never seem to have them when I need them) and put them into that document (so I can actually throw the trash away). And I have a document with "marketing" type stuff for it- title ideas, ideas for when I pitch it, a summary, etc. I love how you just have one document with your ideas/notes, and how you also have one with your marketing ideas. Very helpful! I will have to do the same with my mess. I try so hard to keep things in order, but sometimes it just doesn't happen. This sounds suspiciously like me, which makes me wonder how much you know... ;) So, I do all of this to try to keep ideas organized, but once I'm writing, I use Scrivner, and it has changed my writing life. my writing stuff is pretty unorganized too. things are filed and sorted ON my computer, but my writing desk is a wreck. I have loose notes everywhere. 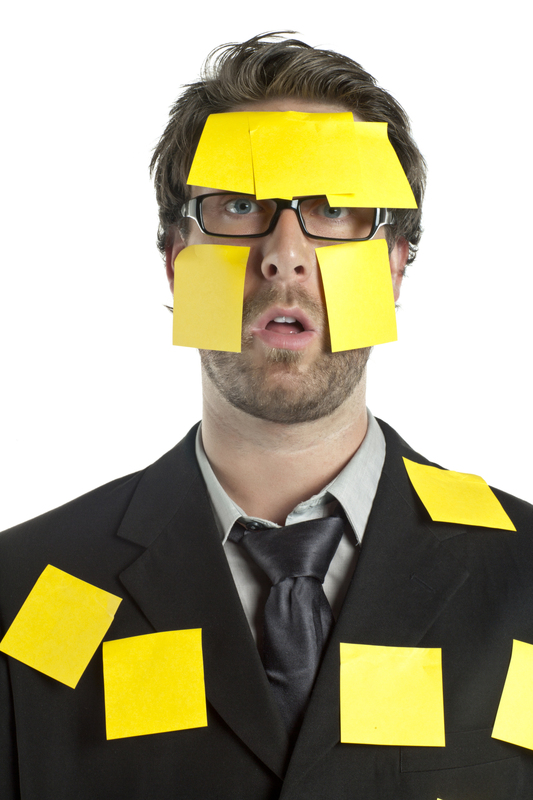 I can relate to the yellow sticky note guy!